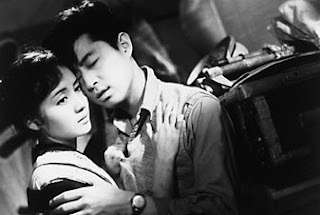 Stolen Desire (1958), Imamura’s first feature film, and the first of three films he released in that year, is his delightful tribute to the “earthy” citizens of the Kawachi district of Osaka. From this film onward, Imamura expressed his interest in what were considered the lower rungs of Japanese society. One of the lowest were actors, especially the traveling kabuki actors we follow in this film, whose troupe is constantly referred to in the film as a “beggar theater.” This colorful lot includes Shinichi (Hiroyuki Nagato), the troupe’s stage director, whose ambitions for elaborate and artistic productions are often frustrated by his less-than-disciplined cast; Chidori (Yoko Minamida), an actress married to Eizaburo (Shinichi Yanagisawa), a star of the troupe whom Shinichi is in love with; Chidori’s sister Chigusa (Michie Kita), another actress who is in love with Shinichi, and is jealous of Shinichi’s obvious affection for her sister. The film begins with a narrator’s voiceover extolling the fact that 13 years after World War II, there is now “no trace” of the war, and that the people there have been pretty much unchanged for hundreds of years. We focus in on the troupe’s last performance of “The Loyal 47 Ronin.” As always, the kabuki performance opens with a striptease show, after which most of the largely male audience exits the theater before the actual play. The narrator amusingly notes that although students almost never attend these shows, there is a sign prominently displaying student discounts. The performance is aborted after an actor onstage refuses to say his lines, complaining that he hasn’t been paid. The fight moves outdoors, with one of the actors trying to grab the cash box from the ticket seller’s hands, culminating in Shinichi going after the fighting actors with a hammer. The troupe is forced to leave after their stage is taken down by workers in need of timber. The troupe leader says he cannot pay them and they should go their separate ways. However, the actors say that they will stay with him. Shinichi sticks with them also, even though a friend of his has offered him a job directing television. He also remains there because of his longing for Chidori. They move on to another village, and after raucous negotiations with the local landowner Fujita, the owner of a brush factory in the area, they set up a tent in a paddy field. The actors are an immediate sensation, especially the actresses whom the men chase after and sometimes peep in on when they are dressing for bed. The men especially enjoy the opening strip show, and the troupe plays to packed houses. The conflicts and love triangles continue here also. Imamura’s love for these passionate, uncouth, and rowdy people comes through beautifully here, and the film is an often hilarious experience, made all the more so by not following a conventional narrative, but instead being a freewheeling and lighthearted portrait of these people. Imamura would continue his examination of the lower classes for the rest of his career, which would include darker portraits of those even lower in society than actors — prostitutes, pimps, killers, primitive societies — which were always interspersed with sensualist and bawdy humor. Stolen Desire is a remarkable debut film that contains many hallmarks of the even greater work to come.